Much has been debated about India’s manpower story. Forecasts suggest that, by 2020, about 60% of India’s population of 130 crore will be in the working-age group of 15-59 years. It is also estimated that, by 2025, India will have 25% of the world’s total workforce. The real problem is that a big labour pipeline could also set off an unemployment trend of epidemic proportions. However, with adequate preparation, that need not be the case. There certainly is an urgent need to put in place a well-designed skills development ecosystem. To understand the urgency, take a look at the findings of the ManpowerGroup’s Annual Talent Shortage Survey (2015)—58% of respondents from India said that filling jobs was difficult (this is against the global average of 38%). 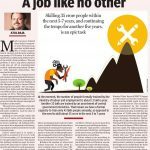 This indicates that, without appropriate skilling, India will not only have the largest supply of manpower, but also the largest unemployed workforce in the world. The only way to avoid this is by building a skill-focused, industry-ready and job-ready workforce. And the time to start doing it is now. 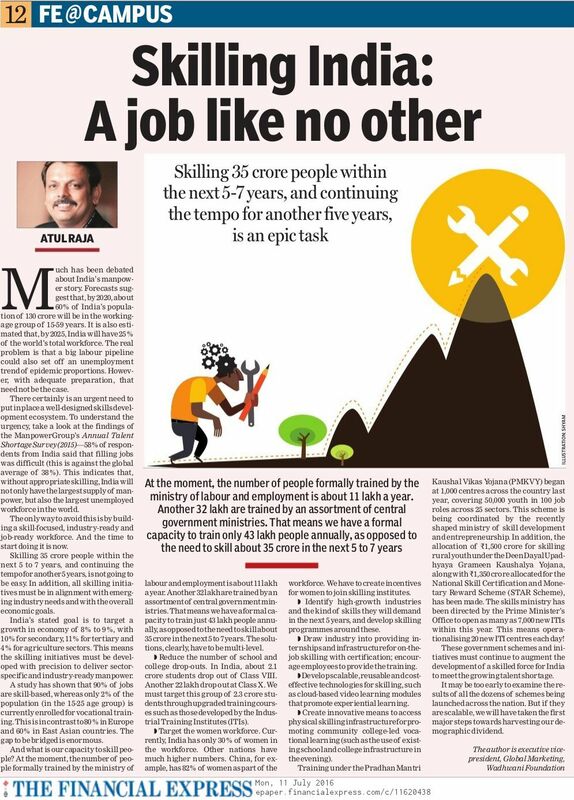 Skilling 35 crore people within the next 5 to 7 years, and continuing the tempo for another 5 years, is not going to be easy. In addition, all skilling initiatives must be in alignment with emerging industry needs and with the overall economic goals. India’s stated goal is to target a growth in economy of 8% to 9%, with 10% for secondary, 11% for tertiary and 4% for agriculture sectors. This means the skilling initiatives must be developed with precision to deliver sector-specific and industry-ready manpower. A study has shown that 90% of jobs are skill-based, whereas only 2% of the population (in the 15-25 age group) is currently enrolled for vocational training. 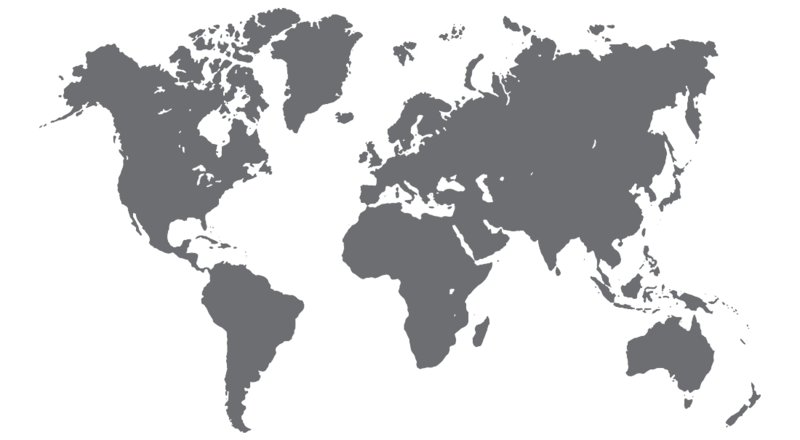 This is in contrast to 80% in Europe and 60% in East Asian countries. The gap to be bridged is enormous. And what is our capacity to skill people? At the moment, the number of people formally trained by the ministry of labour and employment is about 11 lakh a year. Another 32 lakh are trained by an assortment of central government ministries. That means we have a formal capacity to train just 43 lakh people annually, as opposed to the need to skill about 35 crore in the next 5 to 7 years. The solutions, clearly, have to be multi-level. * Reduce the number of school and college drop-outs. In India, about 2.1 crore students drop out of Class VIII. Another 22 lakh drop out at Class X. We must target this group of 2.3 crore students through upgraded training courses such as those developed by the Industrial Training Institutes (ITIs). * Target the women workforce. Currently, India has only 30% of women in the workforce. Other nations have much higher numbers. China, for example, has 82% of women as part of the workforce. We have to create incentives for women to join skilling institutes. * Identify high-growth industries and the kind of skills they will demand in the next 5 years, and develop skilling programmes around these. * Draw industry into providing internships and infrastructure for on-the-job skilling with certification; encourage employees to provide the training. * Develop scalable, reusable and cost-effective technologies for skilling, such as cloud-based video learning modules that promote experiential learning. * Create innovative means to access physical skilling infrastructure for promoting community college-led vocational learning (such as the use of existing school and college infrastructure in the evening). Training under the Pradhan Mantri Kaushal Vikas Yojana (PMKVY) began at 1,000 centres across the country last year, covering 50,000 youth in 100 job roles across 25 sectors. This scheme is being coordinated by the recently shaped ministry of skill development and entrepreneurship. In addition, the allocation of R1,500 crore for skilling rural youth under the Deen Dayal Upadhyaya Grameen Kaushalya Yojana, along with R1,350 crore allocated for the National Skill Certification and Monetary Reward Scheme (STAR Scheme), has been made. The skills ministry has been directed by the Prime Minister’s Office to open as many as 7,000 new ITIs within this year. This means operationalising 20 new ITI centres each day! 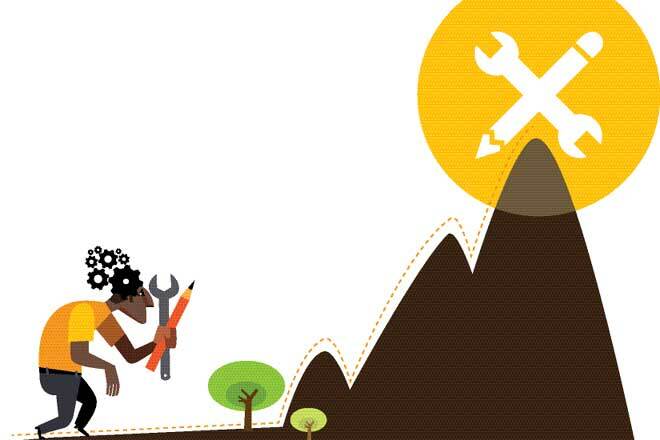 These government schemes and initiatives must continue to augment the development of a skilled force for India to meet the growing talent shortage. It may be too early to examine the results of all the dozens of schemes being launched across the nation. But if they are scalable, we will have taken the first major steps towards harvesting our demographic dividend.